The Elliott wave principle is a form of technical analysis that attempts to forecast trends in the financial markets and other collective activities. It is named after Ralph Nelson Elliott (1871–1948), an accountant who developed the concept in the 1930s: he proposed that market prices unfold in specific patterns, which practitioners today call Elliott waves. Elliott published his views of market behavior in the book The Wave Principle (1938), in a series of articles in Financial World magazine in 1939, and most fully in his final major work, Nature’s Laws – The Secret of the Universe (1946). Elliott argued that because humans are themselves rhythmical, their activities and decisions could be predicted in rhythms, too. Critics argue the theory is un-provable and inconsistent with the efficient market hypothesis. The wave principle posits that collective investor psychology (or crowd psychology) moves from optimism to pessimism and back again. These swings create patterns, as evidenced in the price movements of a market at every degree of trend. From R.N. Elliott's essay, "The Basis of the Wave Principle," October 1940.Elliott's model says that market prices alternate between five waves and three waves at all degrees of trend, as the illustration shows. As these waves develop, the larger price patterns unfold in a self-similar fractal geometry. Within the dominant trend, waves 1, 3, and 5 are "motive" waves, and each motive wave itself subdivides in five waves. Waves 2 and 4 are "corrective" waves, and subdivide in three waves. In a bear market the dominant trend is downward, so the pattern is reversed—five waves down and three up. Motive waves always move with the trend, while corrective waves move against it. The patterns link to form five and three-wave structures of increasing size or "degree." Note the lowest of the three idealized cycles. In the first small five-wave sequence, waves 1, 3 and 5 are motive, while waves 2 and 4 are corrective. This signals that the movement of one larger degree is upward. It also signals the start of the first small three-wave corrective sequence. After the initial five waves up and three waves down, the sequence begins again and the self-similar fractal geometry begins to unfold. The completed motive pattern includes 89 waves, followed by a completed corrective pattern of 55 waves. Each degree of the pattern in a financial market has a name. Practitioners use symbols for each wave to indicate both function and degree—numbers for motive waves, letters for corrective waves (shown in the highest of the three idealized cycles). Degrees are relative; they are defined by form, not by absolute size or duration. Waves of the same degree may be of very different size and/or duration. Behavioral characteristics and wave "signature"
Elliott Wave analysts (or "Elliotticians") hold that it is not necessary to look at a price chart to judge where a market is in its wave pattern. Each wave has its own "signature" which often reflects the psychology of the moment. Understanding how and why the waves develop is key to the application of the Wave Principle; that understanding includes recognizing the characteristics described below. These wave characteristics assume a bull market in equities. The characteristics apply in reverse in bear markets. Wave 1: Wave one is rarely obvious at its inception. When the first wave of a new bull market begins, the fundamental news is almost universally negative. The previous trend is considered still strongly in force. Fundamental analysts continue to revise their earnings estimates lower; the economy probably does not look strong. Sentiment surveys are decidedly bearish, put options are in vogue, and implied volatility in the options market is high. Volume might increase a bit as prices rise, but not by enough to alert many technical analysts. Wave 3: Wave three is usually the largest and most powerful wave in a trend (although some research suggests that in commodity markets, wave five is the largest). The news is now positive and fundamental analysts start to raise earnings estimates. Prices rise quickly, corrections are short-lived and shallow. Anyone looking to "get in on a pullback" will likely miss the boat. As wave three starts, the news is probably still bearish, and most market players remain negative; but by wave three's midpoint, "the crowd" will often join the new bullish trend. 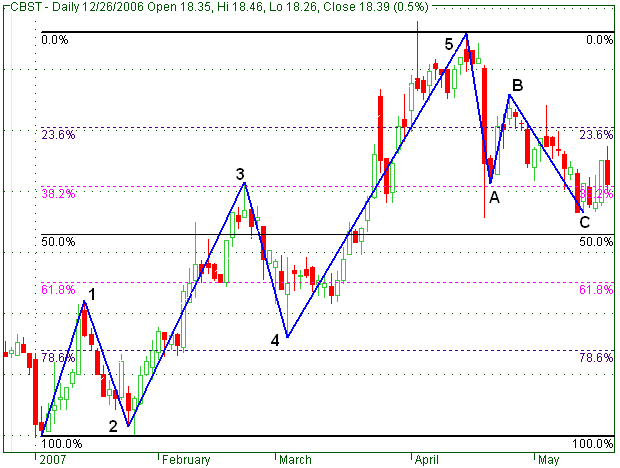 Wave three often extends wave one by a ratio of 1.618:1. Wave 4: Wave four is typically clearly corrective. Prices may meander sideways for an extended period, and wave four typically retraces less than 38.2% of wave three. Volume is well below than that of wave three. This is a good place to buy a pull back if you understand the potential ahead for wave 5. Still, the most distinguishing feature of fourth waves is that they often prove very difficult to count. Wave 5: Wave five is the final leg in the direction of the dominant trend. The news is almost universally positive and everyone is bullish. Unfortunately, this is when many average investors finally buy in, right before the top. Volume is lower in wave five than in wave three, and many momentum indicators start to show divergences (prices reach a new high, the indicator does not reach a new peak). At the end of a major bull market, bears may very well be ridiculed (recall how forecasts for a top in the stock market during 2000 were received). R. N. Elliott's analysis of the mathematical properties of waves and patterns eventually led him to conclude that "The Fibonacci Summation Series is the basis of The Wave Principle." Numbers from the Fibonacci sequence surface repeatedly in Elliott wave structures, including motive waves (1, 3, 5), a single full cycle (5 up, 3 down = 8 waves), and the completed motive (89 waves) and corrective (55 waves) patterns. Elliott developed his market model before he realized that it reflects the Fibonacci sequence. "When I discovered The Wave Principle action of market trends, I had never heard of either the Fibonacci Series or the Pythagorean Diagram." The Fibonacci sequence is also closely connected to the Golden ratio (1.618). Practitioners commonly use this ratio and related ratios to establish support and resistance levels for market waves, namely the price points which help define the parameters of a trend. Finance professor Roy Batchelor and researcher Richard Ramyar studied whether Fibonacci ratios appear non-randomly in the stock market, as Elliott's model predicts. The researchers said the "idea that prices retrace to a Fibonacci ratio or round fraction of the previous trend clearly lacks any scientific rationale." They also said "there is no significant difference between the frequencies with which price and time ratios occur in cycles in the Dow Jones Industrial Average, and frequencies which we would expect to occur at random in such a time series." Robert Prechter replied to the Batchelor-Ramyar study, saying that it "does not challenge the validity of any aspect of the Wave Principle...it supports wave theorists' observations." The Socionomics Institute also reviewed data in the Batchelor-Ramyar study, and said this data shows "Fibonacci ratios do occur more often in the stock market than would be expected in a random environment."